Yesterday evening the atmosphere was very dynamic, with flying clouds. 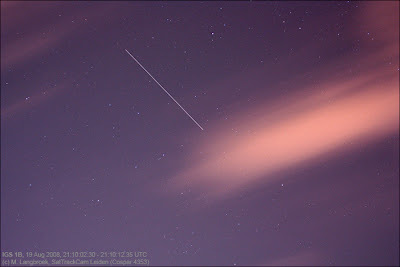 I did manage to capture the NOSS 3-2 pair (03-054A & C) in twilight, and IGS 1B (03-009B). The NOSS image suffered from twilight and clouds, but also yielded a fast stray (which I still have to identify). IGS 1B was very bright again (+0.5) when it came out of eclipse and passed almost overhead. The picture below gives a good indication of the observing conditions.